West Seneca West boys lacrosse was hoping to start 3-0 this season when they played Williamsville North on Thursday. Instead, the Indians were overmatched by a tough Spartans squad, falling 8-6. George Newcomb and Steve Lucas led West Seneca West with three points each while eighth grader Tyler Smart scored as well. 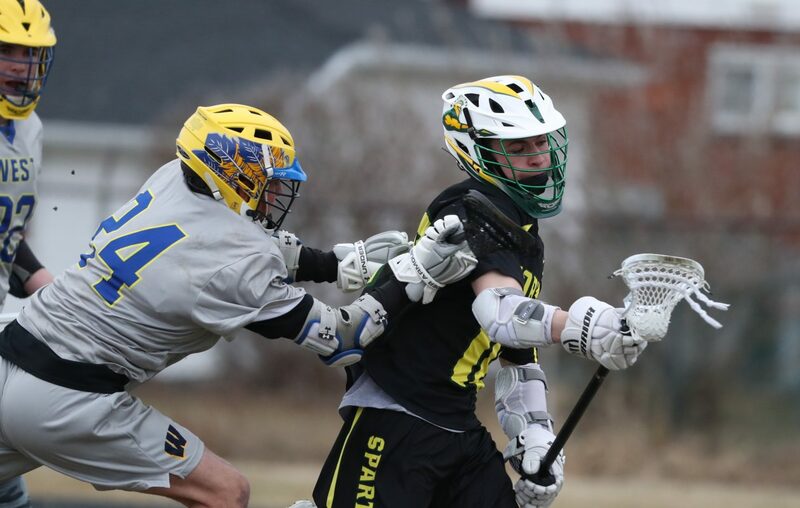 The Spartans couldn’t take advantage of Mike Flury’s prowess on faceoffs. Flury won 17 of 18 for a .944 percentage. Goalie Dan Cantafio allowed the most goals against this season, making seven saves on 15 shots. Everyone’s bat in the lineup was hot for Williamsville North in their season-opening win against Grand Island, 13-1. The Spartans play without a fence in the outfield. Coach Jerry Scarcella has been preaching line drive hitting to his players. Thursday, it paid off. Andrew Fairbrother hit the lone home run, Dylan Wanat went 2-for-3 with four runs batted in and a triple, Cam Zurat had two RBI and a triple and Conner Hoehman added two more RBI. Scarcella says the team is excited for the year and is trying to get to the level of other schools in the ECIC I as they try to win a sectional title for the first time in over 20 years. Sweet Home baseball literally squeezed by West Seneca West on Thursday. In the sixth inning, Everett Quintieri laid down a bunt with Austin Romanowski on third base. It was “executed perfectly,” said coach Jon Campolo to give the Panthers their first win of the season, 1-0. Junior Shawn Gerber pitched and started his first-ever varsity game, going six innings with four strikeouts and one walk. Ean Pokorski picked up his first save of the season, striking out one. Lake Shore girls lacrosse hasn’t lost a step since last season. The Eagles are now 2-0 this season after defeating Lew Port, 22-1, on Thursday and Salamanca, 22-3, on Tuesday. Lake Shore is the reigning Section VI Class C champion being led by Maggie Jimerson and Erica Kennedy. Jimerson had eight goals and Kennedy had seven assists in the win against Lew-Port. Amherst girls lacrosse has started its season 2-0 after a 14-4 victory against East Aurora. The Tigers beat Lew-Port, 18-0, earlier this week. Goalie Raynaleen Richacho stopped five of nine shots on net and four players had at least three goals. Grace VanBuren, Charleigh Rondeau and Leah Shutts each had three goals and Caroline Yoder had four. Isaac Murray of the Buffalo Explorers was named Western New York Club Hockey League Player of the Year during the Hasek’s Heroes WNY High School Hockey Awards banquet on Wednesday night at Key Bank Center. Murray was misidentified in a story about the event, and in a photo that ran online.